"I wish I could stop feeling like I want to be an Irish girl in Ireland." That's an amazing quote from Saoirse Ronan in the new film, Brooklyn, one of the year's best films. The film is based on the book of the same name by Colm Toibin. 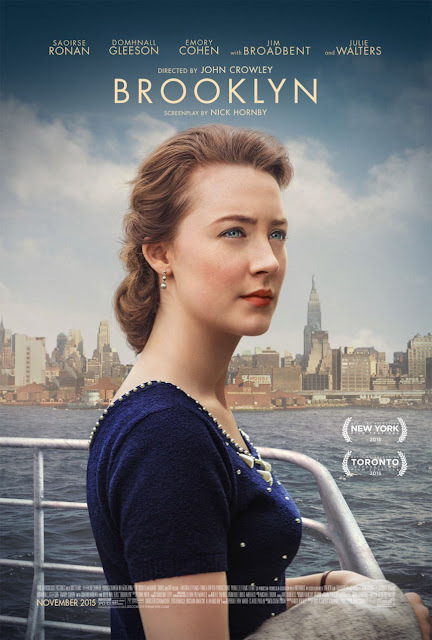 Ronan plays Eilis Lacey, a young girl in 1950's Ireland, who is soon going to immigrate to the United States; specifically to the New York borough of Brooklyn. Her voyage from her hometown of Enniscorthy, County Wexford, Ireland to New York is not an easy one; she suffers from seasickness & is locked out of the bathroom shared by the neighboring bunk. When she arrives to New York, she is given a job at a department store, & she lives in a boarding house owned by Madge Kehoe (played by Julie Walters). Eilis begins to suffer from homesickness, & after breaking down in tears at the department store, Father Flood (played by Jim Broadbent), arranges for her to take bookkeeping classes at Brooklyn College. Father Flood, along with Eilis's older sister Rose, were the people who arranged for Eilis to come to New York. After that, Eilis goes to an Irish dance where she meets a young, Italian-American baseball fan named Tony Fiorello (played by Emory Cohen). Eilis starts to fall in love with Tony, & she is eventually invited to dinner with his family, where she eats spaghetti for the first time in her life, & is also greeted by Tony's brutally honest younger brother, Frankie, who holds nothing back on how the Italians hate the Irish (& he is eventually taken out of the room seconds after mentioning this). But something brings Eilis back to Ireland, something that brings her into the arms of Jim Farrell (played by Domhnall Gleeson), to whom she becomes attracted. Eilis is now torn not only between Tony & Jim, but between two different countries, as she now has more opportunities in Ireland than before she left, although she has made a life for herself in New York. The film is a true masterpiece. Saoirse Ronan gave one of the best performances this year. I think this could give her a second Oscar nomination. Emory Cohen was also excellent as Tony, & he could get an Oscar nomination for Best Supporting Actor. Julie Walters was also excellent, & she could get an Oscar nomination for Best Supporting Actress. The direction from John Crowley was excellent, along with the screenplay by Nick Hornby. The costume design, film score, production design & cinematography were also extremely amazing. The film had some funny moments as well, & because of the style of the film, I was reminded of the 1996 British film, Secrets & Lies. While they don't share the same plot, the tone of the two films were similar: drama, with a lot of humor. Overall, Brooklyn is definitely one of the year's greatest films.